Thank you to the rakyat of Wangsa Maju for coming out in full force to hear us speak. 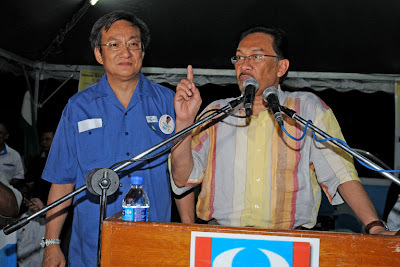 Vote KeADILan for the change we are all looking for – on March 08! Hi bro WeeGreat stuff! It is the begining of the people power in Malaysia. It is the begining of real unity in Malaysia. This is the only hope to be united against injustices and corruption. Bro Wee, you represents all the injustices and corruption in Malaysia as you have suffered a lot for the people in Bukit Bintang. You exposed Tan Sri Loy/MBf financial scandal. Tan Sri Loy used the whole system including the judiciary, to fix you. It has proven in the Lingam Video Clip Scandal. The judiciary (Tun Ahmad Fairuz) disqualified you as the duly elected MP for B/Bintang in 1995 and appointed the BN candidate as MP. This is democracy BN style. 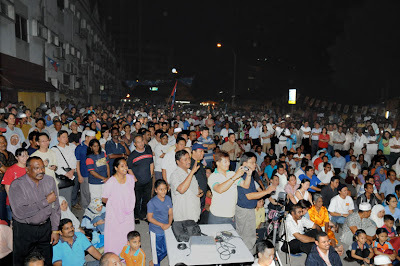 Voters in Wangsa Maju shall give you justice on 8th March so that you can bring justice for the voters in Wangsa Maju. Lets all vote for Wee, a tested parliamentarian who never wavered under pressure. WEE IS DEFINITELY MY MP FOR WANGSA MAJU! Syabas. 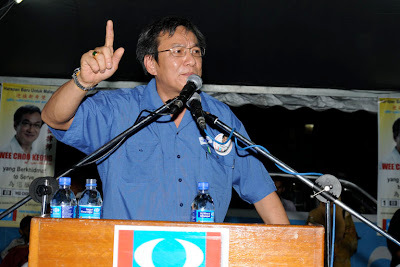 Mr Wee, on 9th March please get ready to work as the MP for Wangsa Maju. You are Mr Wee until 8th March. By 9th March the voters would have spoken loud and clear. You will be formally our YB for Wangsa Maju. Perhaps your next urgent task is to learn the skill of “resurrection”. According to the Singapore Straits Times, Malaysia has on its electoral roll, 8666 voters that are over 100 years of age. Seems like the SPR has resurrecting skills that leave the rest of the world in a mouth gaping awe !!! Wee, you are a true fighter, fight for the truth, fight for rakyat. I got to know your name in MBF case and even you lost then, you still fight for jurisdition in Malaysia. I thought you will be contecting in Bkt Bintang but you decided to move to Wangsa Maju in this eleventh hour. I will still support you. I am certain you will be elected being a superb leader. Your voice will definitely be in the parliment soon. All the best! Hi Mr wee,Just a suggestion when u give ur talks, can u just talk a bit on your experience as a lawyer here in malaysia.YOu have face the rot of it and we’ve heard about it. It sure will be more interesting to hear directly from youWangsa Maju will be there to vote for you! 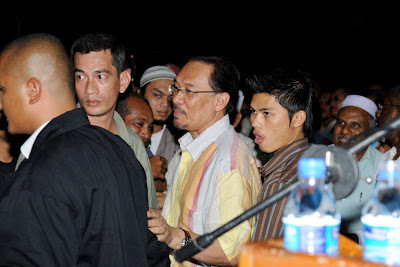 We will vote for you, me, my parents and sister, after listening to you and anwar last night. don’t let us down. Mr Wee, you are the man that Wangsa Maju was looking for all these while. We had to put up with that useless MCA (Money Control All)guy for too long and he did nothing for us except himself. After we heard your dceamah, i checked witha few people and they confirmed that the MCA candidate was responsible for throwing chairs during the MCA Annual meeting. It was due to his ability to throw chair that he rose to such height other wise he will just be a bookeeper for anopther 20years.Wangsa Maju wants an educated representative to speak on our behalf in Parliament and not throwing chairs.So o 8th March, Wangsa Maju, will start the throwing out of Yew from Wangsa Maju and ensure that he will lose his deposit. So Wangsa Maju had an expert in chair-throwing as their MP. What a big joke? No wonder he was unable to perform even in DBKL, when he was the meber of the DBKL Advisory Committee. Since we were fooled by Yew and the MCA, we shall show we meant on the 8th. We will sent him to Holland!!! LKike what other readers have said, send him back to be the book keeper again – let him do what he is good at – throwing chairs and bookeeping. Yew Teong Look, the famous “Chair Thrower”! More of a holigan and yet he was conferred the title of a datuk. What a joke? Wangsa Manju shall call him “The Chair Thrower Datuk”!! !